Earlier today, comics powerhouse DC unveiled a new logo. Well, new logos, as the idea behind the company's new "peeling" motif is that it can be customised for every piece of entertainment it appears on. While that'll mostly be comics, DC did go to the trouble of showing how the property's video games will look. 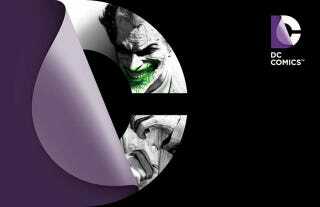 Above is the new logo as it would have appeared on material for last year's Batman: Arkham City, a Joker colour scheme covering up a piece of the game's wonderfully white-washed promotion art. As for the idea overall...what do you guys think? I didn't like it when it was first teased earlier in the week, but seeing how it'll appear on comics and when "themed" makes it look pretty slick.